The article in the Mail bears this out. In it, Rose makes a lot of jaw-dropping statements. To pick three, he says the world is cooling, Arctic sea ice increased 60 percent over last year at this time, and the International Panel on Climate Change is under so much attack they had to hold a “crisis” meeting. These claims are at best misleading. The first and third are just wrong, and the second hugely cherry-picked. I’ll debunk these briefly here, but I’ll note you can get the grim details at the Guardian in a great article by Dana Nuccitelli and John Abraham and at Discover magazine. Hot Whopper has a dissection as well. Rose’s first claim is that the world is cooling. This is simply wrong. There’s long been a claim that global warming has stopped, but this too is wrong. Surface temperatures haven’t increased as much as they did a decade or so ago, but we now understand that the extra heat from global warming is getting stored in the oceans. Surface temperatures are a piece of the puzzle, but like their name implies, they don’t probe the depths of the problem. 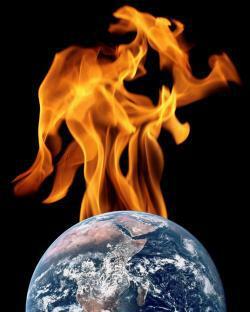 Remember too that nine of the 10 hottest years since 1880 have been in the past decade. 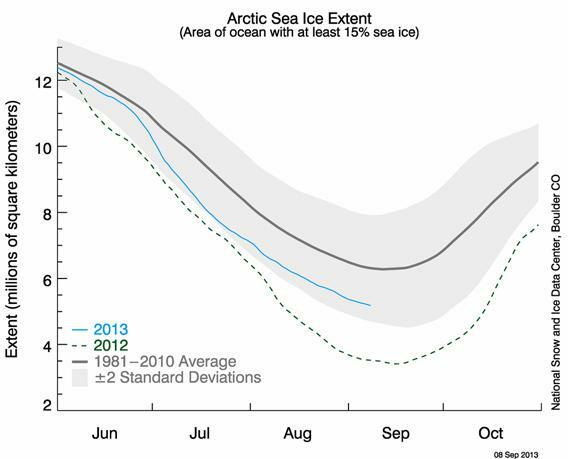 Sea ice extent for summer and fall of 2012 (dashed green line) and 2013 (solid blue line). The dark line is the average for 1981 - 2010. Also, note the headline of the article that says, “Record Return of Arctic Ice Cap as it Grows by 60% in a Year.” That is grossly misleading, making it seem as if the sea ice is coming back. It isn’t. The sea ice grows and recedes with the seasons every year and has been on the decline since spring … and the overall trend over time is definitely downward. 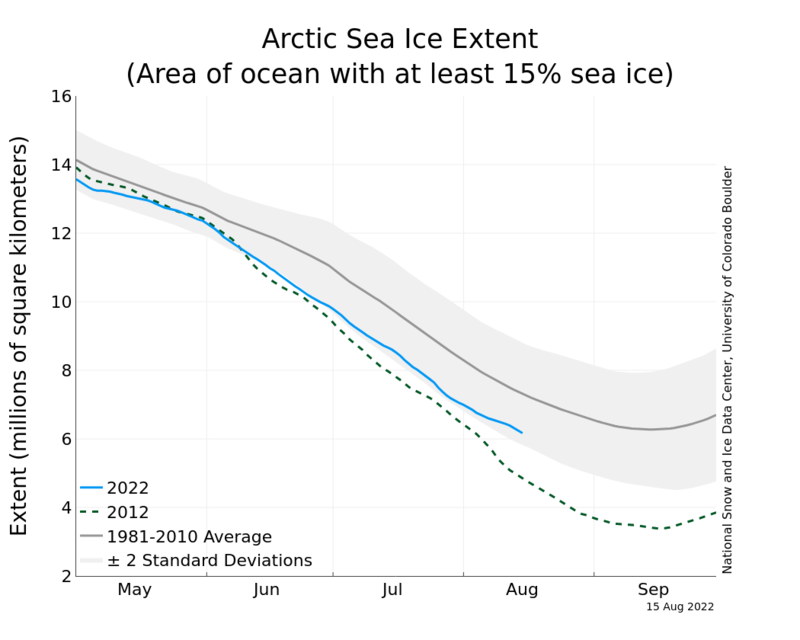 Incidentally, sea ice extent is interesting, but it’s not the best way to look at this. More important is the sea ice volume, which tells you the thickness. Ice can cover a lot of area, but if it’s thin, that’s not good; it melts more readily in the summer. Right now, the trend for sea ice volume is down. Way down. The third claim is that the IPCC had to hold a “crisis” meeting because—get this—Rose’s articles in the Mail have caused such a furor. Such a claim would be fascinating if it were true. But Ed Hawkins, a U.K. climate scientist, says he explained to Rose there was no such “crisis” meeting via email and on the telephone while being interviewed by Rose for the article! This didn’t stop Rose from making the claim anyway. Rose makes lots of other claims, most of which rely on cherry-picking data or predictions by scientists to make it look like they don’t know what they’re talking about. Further investigation (see the links already mentioned above debunking Rose’s nonsense) show he’s wrong about those, too. All of this is exactly what I was expecting when I read his article. Making a mistake or two is one thing—I’ve made some myself—but his history on this topic (like here and here and here to name a few) makes me think his claims really are in the same league as those of flat-Earthers. And while newspapers like the Telegraph are busily parroting Rose’s ridiculous claims, it’s nice to see others like the Washington Post getting it right. Climate change is serious business, and the last thing we need is more hot air about it.